Smoke ‘em inside and let’s go pound some Budweiser! In most previous stories about the Pilots, the Seattle Post-Intelligencer ran only a few photos. That’s because the prints of the game photos disappeared from the newspaper’s archives decades ago, and only a few Pilots images remained – mostly player headshots and a few stadium pictures. This summer, we found dozens of Pilots images that had been tucked away in the same negative sleeves from spring 1969. A wonderful find, even if the quality's not the best on most of them. In fact, they barely look professional. And a shame there are no captions, although I can recognize Schultz, Maglie, Oyler, Crosetti, and I think Brabender and Segui. Too bad there are none of Bouton (that I saw). Maybe they can use a few for the next edition of Ball Four. Love those old Pilots uniforms. I know those old flannels must have been brutally hot and itchy, but they look so much better than today's doubleknits. I played HS baseball in the late sixties. I remember the flannel uniforms as being hot (they would absorb a tremendous amount of sweat), but I don't remember them as being especially itchy. It looks like someone just scanned the negatives (or contact sheets of the negatives) using a regular flat-bed scanner (as a opposed to a high-res film scanner)---I think that's why the quality looks so crappy. I definitely recognize the eyebrows of Larry Haney. 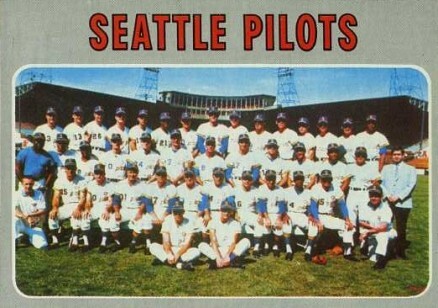 Sorry, but I just can't believe there was ever such a team as the Seattle Pilots. Not believe in the Seattle Pilots! You might as well not believe in fairies! I'm pretty sure photos #33 & 34 are of Segui just because I remember his distinctive pitching motion from when he later played for St. Louis. Did Segui throw a scroogie? (See #34) Some of the early ones looked like baseball card poses so I didn't expect the action shots later. Also looks like the 2nd deck at Sicks must have been right at the backstop since some photos look almost like they were taken from right over home plate. Jose, I don't remember Segui throwing a screwball; if he did, it definitely wasn't his primary pitch. He was known for a terrific forkball, which dove down so much that some skeptics felt it was a spitball. Yes, Segui was known for a forkball that some mistook for a screwball. We can easily identify the action in picture 40 - that's from the Pilots home opener against the White Sox, April 11, 1969, and shows Don Mincher receiving congratulations from Mike Hegan after Mincher hit a two-run homer off Joel Horlen, scoring Hegan, in the bottom of the third. Also looks like the 2nd deck at Sicks must have been right at the backstop since some photos look almost like they were taken from right over home plate. There wasn't a second deck - just the covered stands. The press box and the photo positions were on the roof of the stadium. You can see the layout on this team photo in the 1970 Topps set. That isn't Bouton sitting on the far left in Pic #18? "No. 30 is Freddy Velazquez"
As I recall Phil Rizzuto saying, the broadcasters had to climb some sort of a rickety ladder to get into the press box at Sicks Stadium. He hated that ballpark. A lot of the worst pictures just look like JPEG artifacts to me, which would be a shame as it is so easily fixable. But maybe there was some degredation in the negatives that produces the same result. Also, is Pilots an aircraft industry reference or a harbor reference? Some great history in this thread. Yeah, but why didn't he play in the major leagues in 1964, 1965, 1966, 1967, 1968, 1970, 1971, 1972, 1974, 1975, and 1976? Just for the record, he also apparently didn't play in the minors either in those years, after having played D ball in 1958. I'm assuming the message is there to show that it's an actual gap and not just not a gap in the data. It is clunky, though. Presumably he was playing in the Caribbean or something? Because according to this data he just appeared in the high minors at age 26, after five years in the wilderness. No wonder Ray Oyler was such a shitzy hitter...half his right leg had atrophied away. Tough to hit that way. I'd say both. The logo on the shirt has both a ship's wheel and wings. Also, the scrambled eggs on the cap is reminiscent of airline pilot's caps. The "did not play" notes should be on the minors page instead of the majors for Freddo, but otherwise I'm glad Sean has them. That's not really a gap, it's before his debut. There is no message for the actual gap between MLB stints. It's a gap because it follows his minor league debut (1958). For five years he was out of organized baseball and then came back (mostly in the minors). All the gaps later in his career, he was actually playing in the minors. The problem is that all these notes say "Did not play in major leagues", followed by "(Military Service)", or in this case a mysterious "(Did Not Play)" which is also used for some injuries. It should indicate that in these years he "Did not play in organized baseball at all", not just that he wasn't in the majors. Yep, I large several Al Borland-style plaid flannel shirts, and I don't wear them for their looks. I wouldn't want to wear one on a hot day (linen is probably the best old school fabric for that), but they are the farthest thing from itchy. Doesn't look like him. Also, Bouton said that to make a good impression on the coaches he had his hair cut so short that spring he "look[ed] like a storm trooper." So the notes are supposed to mean "Did not play in organized baseball at all" with the reasons not being a big injury? I notice there is no note for Pettitte or Moyer for last year. The existence of the notes is haphazard. It's probably a work in progress. But where they do exist, it's always for a season where the guy was neither in the majors nor the minors. After he left baseball in 1951, Mr. Soriano joined the Merchant Marine and later became a pilot for ships entering and departing Puget Sound. That job also got some headlines for Mr. Soriano. In 1982, a freighter carrying automobiles crashed into the Blair Bridge in Tacoma while being piloted by Mr. Soriano. And in 1967, a ship he was piloting hit a rock off Smith Island, north of Everett. The Coast Guard suspended his license for that incident, but it was reinstated when the 9th Circuit Court of Appeals ruled the agency had overstepped its authority.